Say "Halo!" to beautiful, glowing skin. Read on to learn why the Halo Laser is quickly becoming one of the most popular laser treatments available. Before treatment, our skin and laser specialists will evaluate your skin to determine if Halo is the best option to meet your needs. If we move forward with treatment, a mild numbing agent will be applied to your skin to help manage any discomfort. The Halo settings will be tuned specifically to your skin type and needs, ensuring precise treatment that directly addresses your concerns. After your treatment, you will need to take special care of your skin. The first few days after treatment, your skin will feel warm and tight, and have a slightly rough texture to touch. Within a week, the roughened skin will flake lightly, revealing fresh new skin underneath. It’s important to avoid sun exposure and keep skin in the treatment area well-moisturized until you have fully healed. With only one or two treatments, patients can experience a marked improvement in red as well as brown pigmentation, fine lines, textural irregularities, and pores. The Halo treatment has already been designated the new “gold standard” for pore reduction, one of the most common areas of skincare concern and the most difficult to address. Here are answers to some of the most commonly asked questions about the Halo laser. What the difference between ablative and non-ablative? Halo is able to provide such impressive results because it combines the power of both ablative and non-ablative wavelengths. Ablative lasers work by removing outer layers of dull, damaged skin to reveal healthier skin underneath. This prompts your body’s natural healing response, triggering increased collagen production in the area. Ablative lasers are often used to successfully treat fine lines, acne scarring, and sun damage. Results are dramatic, though they often come with a longer recovery period and a few unwelcome side effects, such as swelling, redness, or changes in pigmentation. 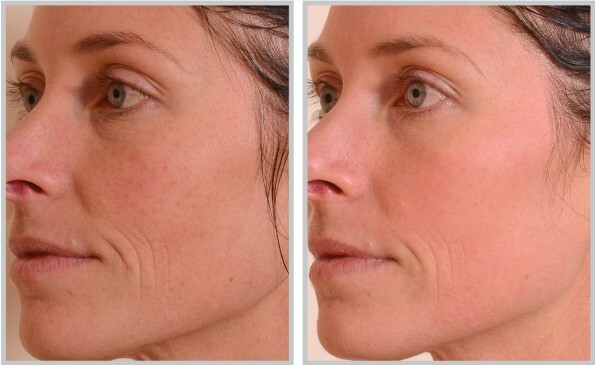 Non-ablative lasers typically provide less dramatic and slower results, though they are much less invasive. Non-ablative lasers heat up the tissue, but do not destroy it. This stimulates collagen production to address minor skin concerns without removing the upper layer of skin. These lasers are a popular option for treating minor imperfections, light scarring, and fine lines, though multiple treatments are typically required. What does hybrid fractional really mean? Hybrid fractional means that two different laser wavelengths (traditionally used separately) have been woven together to provide a synergistic result. With this combined approach, Halo offers beautiful results without the downtime of more aggressive treatments, and without the necessity of multiple series of treatments. The manufactures of HALO laser chose the name HALO because of the distinct youthful glow that patients experienced after the treatment. Young, beautiful skin naturally reflects light, and HALO laser is able to restore some of that youthful shine. The face is always the most common area of concern, but HALO laser provides beautiful results for the neck, décolletage, and hands as well. It is the preferred treatment to remove textural pigmentation on the sides of the neck called “poikolderma”, which is a common condition in our former sun worshippers here in San Diego. How do I need to prepare for a HALO treatment? As with any laser treatment, the most important thing to do to prepare is avoid direct sun exposure. In some cases, prescription skin lighteners may be recommended by your clinician to prep your skin for 2-8 weeks prior to your treatment. What will my experience be like on the day of treatment? After your photos are taken, a strong topical numbing cream will be applied to the area of treatment. With the addition of cold streams of air, this makes the treatment relatively painless. You will experience a warming sensation as the laser is applied to your skin. This warming sensation typically lasts until 30 minutes after the treatment. Treatment time is approximately 30-40 minutes. Immediately after the treatment, a recommended moisturizer and sunscreen will be applied. Our medically approved Oxygenetic makeup can also be applied if desired. For the first two or three days, slight redness, swelling, and a bronzing appearance to the skin will develop. During this time, hot activities and vigorous exercise, such as heated yoga and running, should be avoided. By day three or four, your skin will begin to lightly flake, revealing fresh new skin beneath. How soon will I see results after the treatment? Results can be seen as soon as 7 days after initial treatment. Most patients see the greatest results in the first 2-3 weeks, but your skin will continue to improve for up to 2 months. See the Halo Laser in action! How much does Halo cost? Actual prices may vary based on the area you’re having treated and how many treatments are recommended for you to see optimal results. Need help budgeting for treatment? See our payment & financing options. You can apply for financing online! Sciton® Halo is the world’s first and only hybrid fractional laser, and LJCSC is thrilled to offer patients treatment with this revolutionary new technology. Offering maximum benefit while minimizing downtime, Halo provides fully customizable, minimally-invasive laser skin resurfacing suitable for treating a variety of skin concerns on all skin types. The Halo laser has a 92% “Worth It” rating from surveys conducted by Real Self. Traditionally, lasers come in two options: ablative and non-ablative. Halo offers both options in a single pass, addressing both mild concerns in the epidermis and more severe skin issues in the dermis during the same treatment. This both provides more dramatic, comprehensive results and minimizes total downtime. When you come in for your treatment with Halo, we are able to fully customize your experience to specifically address your unique skin concerns. The Halo system will determine the exact level of energy needed to safely and effectively treat your skin through intelligent energy delivery and Dynamic Thermal Optimization. This results in a precise treatment that evenly covers the area. Diminishing the appearance of sun damage, such as sun spots, uneven skin tone and texture, and hyperpigmentation. Reducing visible signs of aging, such as deeper wrinkles and creases on the face (ablative setting) and age spots or uneven tone (non-ablative setting). Improving the appearance of scarring, such as from acne, chickenpox, or miscellaneous blemishes or injuries. If you’re looking for a great laser result with minimal and manageable downtime, we have just what you need. La Jolla Cosmetic Surgery is one of the first practices in the country offering Sciton’s HALO hybrid fractional laser, the latest advance in laser technology available on the market today. Your team at LJCSC is always looking for ways to provide optimal laser treatments: which we define as quality result with minimal recovery that enables you to return to work and activities as quickly as possible. We think the HALO laser treatment nails it in both categories, quality of results and minimal downtime. If you’re ready to experience beautiful, youthful skin for yourself, give us a call. The aesthetic services team at the La Jolla Cosmetic Medical Spa will work closely with you to find the best treatment to bring out your glow.